- work. I'm on nights at present, which presents its own challenges. - academic work that is part of my training and which I need to make a dent in soonish. - house hunting. Mrs. Kinch is determined that we find a house. I'd also love to find a house, but I'd also like another two hours in the day in which to sleep. Unfortunately, the house that we had set our heart on sold, so we're back to the drawing board. Mrs. Kinch continues well and is with her parents in the country for the weekend; sunning herself and teasing stable lads to keep her hand in, no doubt. Wargaming has been conspicuous by its abscence, though I have managed to make a little progress. Above you'll see some of the new Indian army, troops mustered for me by a friend who does a spot of comissioned work. The cavalry are HAT Cossacks converted with green stuff turbans into Pindaree horsemen. The foot are ESCI Arabs, irregular types - all bad manners and ten rupee jezails. I have a regular battalion of Indians ready to be dispatched to young Fatzington. Not sepoys exactly, but European drilled troops of my imaginary Indian state. I'll probably have them attired as Dodds Cobras, a similar body of chaps from one of Bernard Cornwell's Sharpe novels. The other spot of wargaming news was the arrival of the first issue of the Classic Wargamers Journal, an excellant publication that cheered a weary soul. Between these pages you'll find battle reports, four scenarios and articles on officer personalities, painting large units and Desert Island Wargaming. The focus is very much on the experience of the game, rather than preparation or potted history - thus far the focus appears to be on horse and musket battles, though this will change apparently. I'm secretly hoping this is not the case, as I'm a horse and musket man - but this will depend on the contributors I suppose. More idiosyncratic than Battlegames, less polished by Miniature Wargames, more absorbent than Wargames Illustrated - the Classic Wargamers Journal reads like the labour of love it is. You may subscribe (and I urge you to do so) by clicking here. *I am reliably informed by one of my older friends that a Tamasha is a big party, though apparently it means drama and can also mean a great to-do. "Wellington in India: A Wargamers Guide"
I recently bought a copy of "Wellington in India: A Wargamers Guide" from Caliver Books. What you get for your money is a potted history of Wellingtons campaigns in the Mysore and Mahratta Wars, some uniform details, three scenarios and a set of rules. The rules are different from the usual Grant fare as they use a roster system and are consciously modeled on Paddy Griffiths work in Napoleonic Wargaming for Fun. One of the disadvantages of having the Memsahib back in the establishment is that there has been return of certain aspects of domestic tyranny. No longer may Kinch leave coffee mugs around the house with gay abandon or wander trouserless and free, thinking deep thoughts in the secure confines of his own home. A welcome aspect of this is that I have had quite a build up of paperwork over the last few weeks and Mrs. Kinch is good at keeping my mind on the matter at hand. She ruthlessly cleaned some toy soldiers out of the drawing room when it looked like they were distracting me and has promised a bounty (there was mention of her famed chicken and ham pie) upon completion. It was during a brief break, made all the sweeter by being illicit, that I came across the gentleman above. The text asserts that rockets were an integral part of the Mahratta military system, but several key questions were left unaddressed. 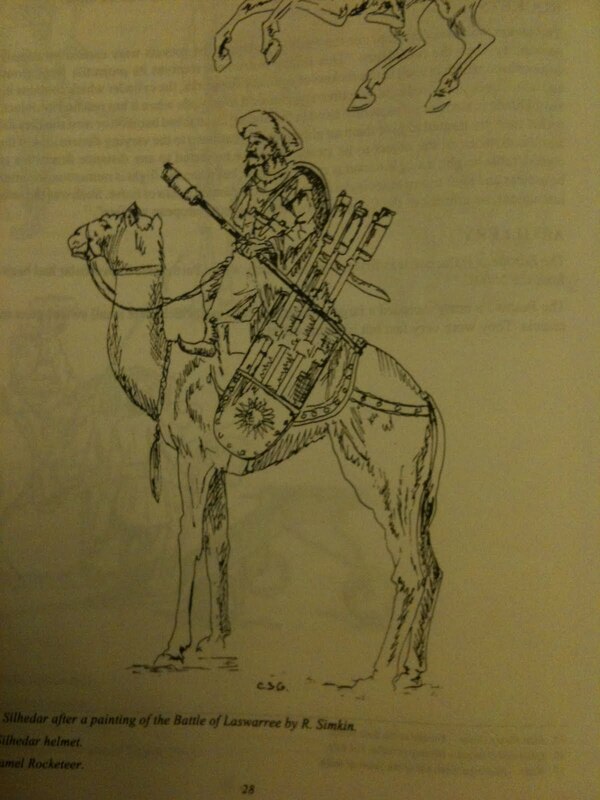 Did the Johnny on top dismount from his camel before loosing off rockets at the foe? If he didn't dismount, how did he stop the camel afterwards? Conrad Kinch explaining his lack of posts to an irked readership. Mrs. Kinch update: Mrs. Kinch is home and well. Most importantly she is longer leaking spinal fluid from her back. The change that came over her on returning to her own home was extraordinary. The wargaming cubboard has been rather bear of late. One discovery I did make was Two Fat Lardies Summer and Christmas specials; I've been spending a great deal of time in hospital waiting rooms of late and I often find reading wargaming material a very pleasent diversion, when something cheerful and undemanding is required. The Lardies Specials are £5 a piece for a PDF file with usually between 100 and 140 pages of content comprising additional rules, scenarios and other material for their stable of rules as well as general modelling articles. All of this presented with the Lardies trademark sense of humour, which I rather like, though it is not to all tastes. Most of the specials are rather Second World War heavy as "I ain't been shot Mum", "Tactics, Weapons and Troops" and "Bag the Hun" are all written with that period in mind, but that is no real hardship and I'm happy that I'll convert several of the scenarios to Memoir '44. 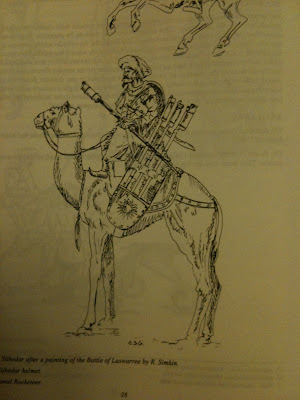 Historically, I haven't enjoyed aerial wargames - but Two Fat Lardies have a set called "Bag the Hun!" The name itself sings its a siren song. Delivered straight to your inbox - I read mine on my phone - there's a lot of reading in a Two Fat Lardies Summer Special. Surprisingly, given the name - there is very little fat here, just solid wargaming material engagingly written. The last week or so has seen me doing quite a bit of reading while in A&E departments and the like. I used to be quite manic about always having a book about my person, though the advent of the IPhone has weaned me off the habit. That said, honest to God paper and pasteboard reading material trumps a screen every time. I would have been hard pressed to name the author. 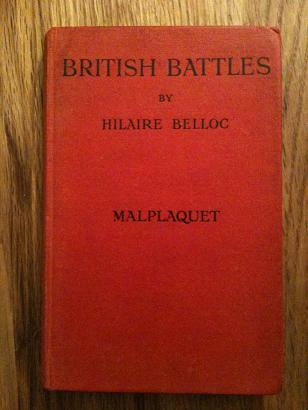 British Battles: Malplaquet is a compact little battle book and quite distinct from the genre as it is understood today. There is no detail on the impedimenta armies involved, Mr. Belloc does not give a fig for what manner of hat the French infantry wore or the colour of the facings of the Dutch Guards. What you do get for your money is an admirably brief outline of the geo-political background of the battle, a thorough description of the ground and some interesting musings on the outcome. The battle itself is described in thirty pages and is a bloody and desperate affair. I have read a little of David Chandlers work on Marlborough, but the War of the Spanish Succession appears to have been a particularly sainguinary business. 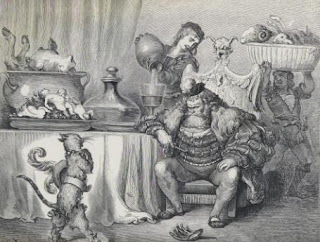 Bellocs thesis appears to be as follows; Louis XIV was put in an intolerable position by Allied demands that he make war on his grand nephew (the relationship is clear, while the nomenklature is not) and therefore peace was not worth negotiating for. Essentially a Treaty of Versailles situation, but one where the Germans didn't swallow the bitter pill and decided to fight on in the hope of negotiating a more advantageous peace. The French dodged battle for as long as they could, leaving Marlborough and Prince Eugene of Savoy to attack the fortress of Tournai. Tournai held out for rather longer than expected and by the time it fell, the French under Marshall Villars were in a position to give battle, albeit defensicely. The Allied forces attacked them in prepared positions at Malplaquet and were drawn into a long and bloody fight. The French quit the field, thus losing on points, but the Allies suffered far higher casualties and found pursuit impossible. Their habit of victory was tarnished and Marlborough was recalled as a result. 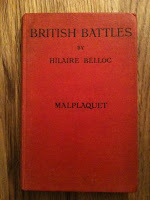 Bellocs summation; a battlefield victory for the Allies, but a political victory for the French. I enjoyed this book, though it lacks many of the standards of the contemporary battle book, because of its emphasis on politics. An intriguing read and for a book that cost a shilling in Newman & Co Booksellers of Calcutta, well worth the money. Mrs. Kinch update: Mrs. Kinch has endured her second operation and we are tentatively optimistic. She is no longer leaking spinal fluid from her back, nor is she suffering the appalling headaches brought on by an insufficency of liquid to cushion the brain. She is still in hospital and will remain there for a few more days. She has asked me to pass on her thanks for your good wishes and is up and demanding Harry Potter books, which is definately a good sign. 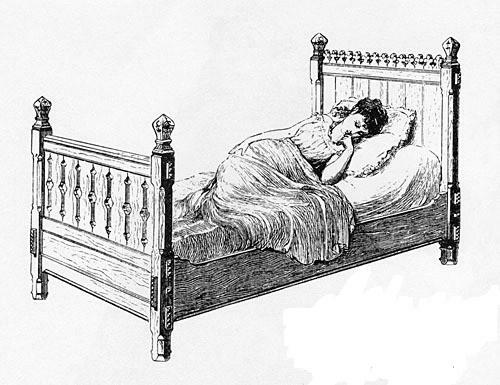 Mrs. Kinch at her sickbed. the artist on account of not being proper Art. The last few days have been so busy that is has prevented me from posting. I was greatly saddened by the death of Paddy Griffith, a great and generous soul. He was a funny, active man with no side or pomposity to him and it was a pleasure to play games with him. He challenged me in every encounter, whether it was taking me to task for writing that simply wasn't good enough or outwitting opponents on the field of honour. His work speaks for itself and is a fitting monument to the man. He and his family have been much in my thoughts of late. Mrs. Kinch is back in hospital. Her convalesence was going well, until some post-operative complications led to greatly increased pain. She weathered this with her usual stoicism and I had hoped that her trials were at an end. I took an afternoon off to play a game at Donogh's while Mrs. Kinch was being looked after by a companion. Unfortunately some rather dramatic scenes ensued on Saturday night and we hurried to the hospital again. Mrs. Kinch is being kept in Intensive Care and being scrutinised by some very highly paid wallahs in white coats. These gentry are distinctly sketchy on what is wrong with her*, but are agreed that they've managed to rule out the worst possibilities. *Though my mother in law did point out that Mrs. Kinch is well past warranty and that she and Mr. Morris operate a strict no returns policy.